Beijing is famous for its sliced Peking Duck, and it is about time that Singapore promotes more of the flavourful Herbal Roast Duck, found at Dian Xiao Er. Actually, I do not know of anywhere here which makes these herbals ducks better than them. I am a more of a chicken than a duck person. But when I have duck cravings, I know l can make my way to Marina Square which is one of its original branch. Or NEX which has a fascinating ang-pao red colour and décor, red ribbon lanterns and a red OTT wedding wall. No kidding –it’s quite interesting and you feel transported back to the period drama times of China. Dian Xiao Er’s signature dish is the Ten Wonder Herbs Roast Duck ($13.60 for small, $25.30 for medium), where the herbs is said to revitalize energy and relief mental stress. I am not sure if it is indeed the herbs or duck, but I do feel happier after savouring a slice of its meat – tender and somewhat sweetish juicy. You know how duck meat at lousier stalls can be dry and tough, this is the opposite. I much preferred its less known Angelica Herb Roast Duck ($12.90 for small, $24.30 for medium), where the flavours are stronger and less herbal. If you never never never ever had Dian Xiao Er’s duck before, you never know what you are missing out. Imagine your usual favourite roast duck but with more juice that is sealed within the duck, said to be marinated overnight to allow the sauces to fully permeate within. If you want something lighter to balance the taste, I would recommend the Wheatgrass Tofu ($12.60) which is slightly jade green as it is infused with wheatgrass extract. Fried with fresh prawns and scallops, the beancurd is soft and sauce quite healthy-tasting. Heard of Gangnam style prawns? This is not exactly Korean, but a tongue-in-chic way to name Dian Xiao Er’s Jiangnan Baked Fresh Prawn ($21.90 for small, $43.60 for large). The taste somewhat reminds of the aromatic butter crabs I had in Malaysia, and rest assured that the prawns are HUGE. 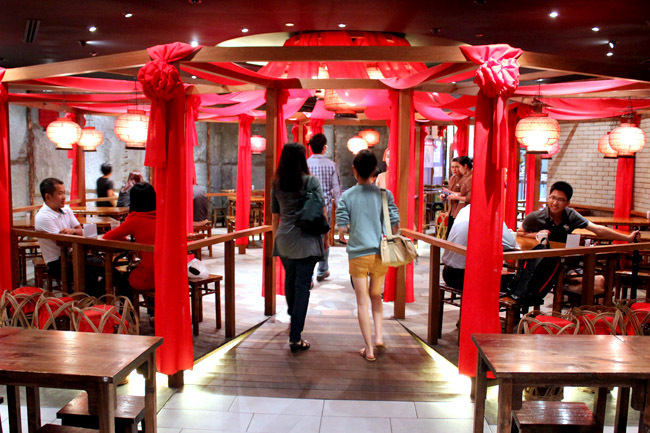 Dian Xiao Er also offers Chinese New Year Reunion Dinner Takeaway Reservation. If you prefer dining in the comfort of your home, get their takeaway packages which can include their signature Herbal Roasted Duck and Prosperity Yu Sheng. Dian Xiao Er will be giving 5 sets of $50 vouchers to 5 lucky Daniel’s Food Diary readers! Step 3: Leave a comment below to name the dishes you would order if you won the $50 voucher. Results will be announced Tues 15 Jan 2013. Contest winners must have local Singapore addresses. Jia You! *The above entry is brought to you by Dian Xiao Er. ← Tonkotsu Kazan Ramen – Ever Tried A Volcano Ramen? Liked and shared on facebook! would like to try out their signature dish Ten Wonder Herbs Roast Duck. I would like to try the Ten Wonder Herbs Roast Duck and Jiangnan Baked Fresh Prawn! yummy! I always order the Ten Wonder Herbs Roast Duck! And as well as their sliced fish with tangy sauce. Very nice. Their vegetables, the one with the stock and the one with the lotus root is very nice and crisp. And Liked and Shared! I would like to try the Ten Wonder Herbs Roast Duck and Jiangnan Baked Fresh Prawn! Liked and Shared. I Love their roast duck! Would order their roast duck and definitely want to try their Wheatgrass Tofu as well! One of the must-have if you dine there! I would like to try the Ten Wonder Herbs Roast Duck. Jia You! I would like to try the Ten Wonder Herbs Roast Duck. 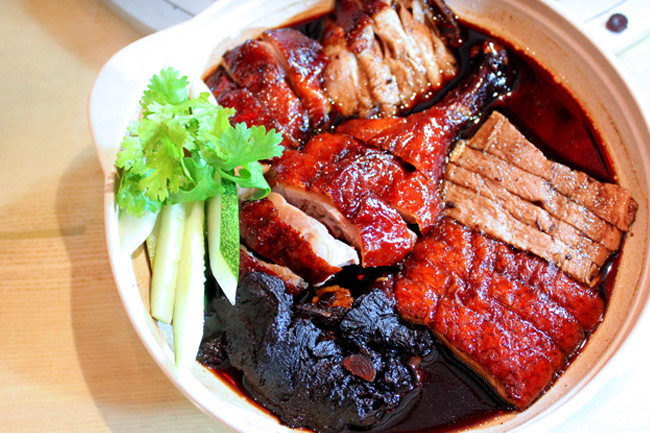 Dian xian er roast duck was my best dishes and their all kind of signature dishes.. making my mouth alway watery… yummy. Wow wow wow.. Super Yummy Roast duck + Wheat grass Tofu+Jiangnan Baked Prawns+Brocoli with Scallop.. yummylicious meal for my family! 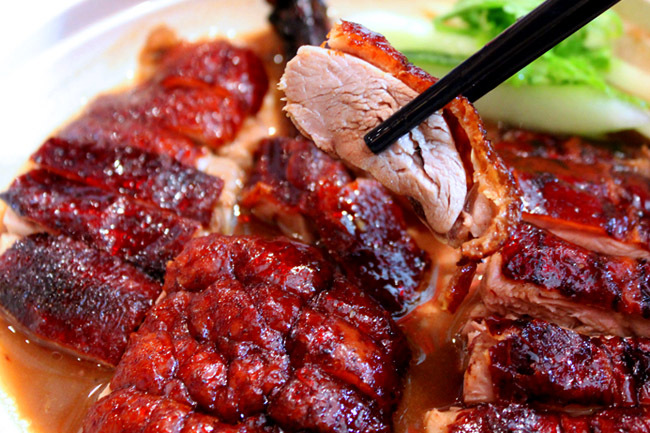 If win the $50 voucher, i will definitely order the all time favourite dish – DUCK!! And Dong Po Pork & Stir Fried Lotus Root with Macadamia Nut to enjoy it with my family! I <3 to dine at Dian Xiao Er (Singapore)! 1. Duck Roasted with Angelica Herb ($12.90), fragrant, flavourful, yummy! 2. Dong Po Pork ($13.90), tender & melts-in-the-mouth, sinfully addictive! 3. Baked Fresh Prawn JiangNan Style ($21.90), king prawns with butter FTW! 4. Wheatgrass Tofu ($12.60), unique, and combination of my fave wheatgrass & tofu! I <3 to dine at Dian Xiao Er (Singapore)!!! 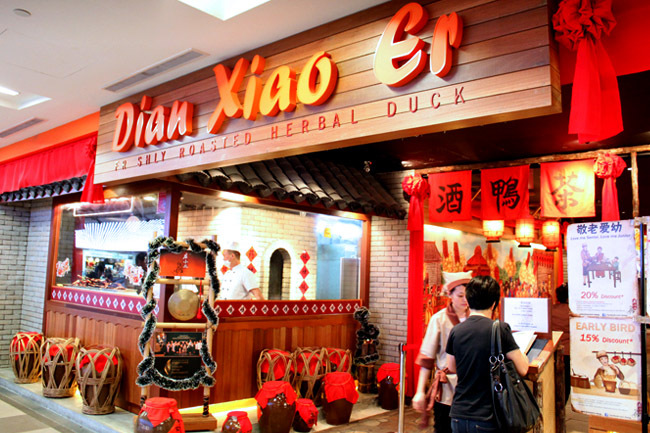 I always order Dian Xiao Er Ten Wonder Herbs Roast Duck whenever I visit their outlet monthly. My wife loves it very much! Definitely ordering Ten Wonder Herbs Roast Duck, wheatgrass tofu and the ma po tofu. I have visited Dian Xiao Er Once, i will like to visit it Twice….. Cheers! Ten Wonder Herbs Roast Duck. I will order the roasted duck with angelica herb, mongolia ribs, soup of the day! 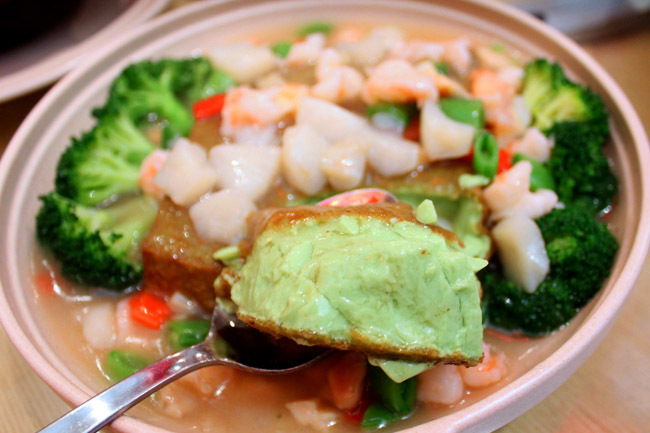 I would order the Wheatgrass Tofu & the Jiangnan Baked Fresh Prawn (large)! Duck Roasted with Ten Wonder Herbs is a must-order dish whenever I patronize the restaurant and I would like to try a healthier choice of Stir Fried Lotus Root with Macadamia Nut. Mouth watering now…….. I know I have to join this giveaway when I see it's Dian Xiao Er! I loveeee the Chinese cuisine they serve! 1. Angelica Herb Roast Duck. 2. Baked Fresh Prawn JiangNan Style. 3. Deep Fried Kai Lan with Pork Floss. 4. Seafood Fried Rice with XO Sauce. 1) A big portion of the Ten Wonder Herbs Roast Duck! 4) The Claypot Sea Cucumber with Shitake Mushrooms and Tendon sounds yummy too! If I win the $50 voucher I would definitely order Ten Wonder Herbs Roast Duck and Jiangnan Baked Fresh Prawn..
Herbal roasted duck, wheatgrass tofu and Jiangnan baked fresh prawns! will try the above mentioned! especially the angelica herb roast duck. Mongolia Spare Ribs, Angelica Herb Roasted Duck and Black chicken soup, Dong Po Pork and Braised Mushroom in Chinese Wine!!! I would use the $50 to order anglica herb roasted duck and try out the gangnam prawn. Congrats on winning a $50 voucher from Dian Xiao Er! Please send an email to DanielFoodDiary@gmail.com with your contact details! I so wanna sink my teeth in the Ten Wonder Herbs Roast Duck & Jiangnan Baked Fresh Prawn!! I will order whatever that they recommend, since i haven’t been there and don’t know the menu. Let see whether got chance to win and go! Definitely the Angelica Herb Roast Duck! I've been a regular customer of Dian Xiao Er for as long as I can remember! I'm really impressed with the effort put into their food and I love the entire ambiance of the restaurant. If I won the voucher, I would like to try other dishes I haven't tasted. ( which I believe are also super-yummy). 1)Silver Cod Fish in Superior Soy Sauce. 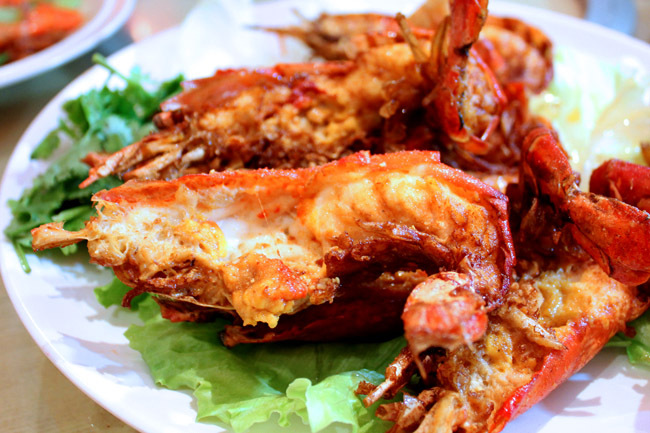 2) Jiangnan Baked Fresh Prawn. 3) Stir Fried Bitter Gourd & Pumpkin. Silver Cod Fish in Superior Soy Sauce. & Red Bean Pancake for dessert! Too many to name, but if I have to, then will be the DUCK, soup and cod fish! – Boxing Chicken with Jack Fruit Sauce. – Stir Fried Lotus Root w Macadamia Nut. – Seafood Combo w Assorted Vegetables. 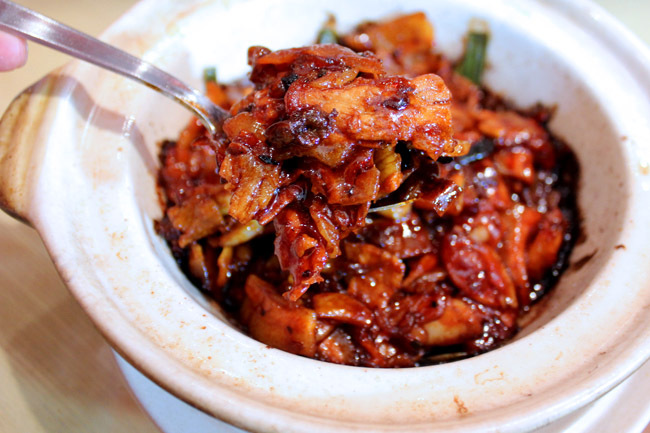 -Claypot Sea Cucumber w Shiitake Mushroom and Tendon. I will share these goodness with my family and extended family as we have not eaten here before. And I have heard quite some good reviews on Dian Xiao Er. Liked the pages and shared too! Seafood Fried Rice with XO Sauce. Definitely the Angelica Herb Roast Duck. Enter me please! I MUST win this as I'm a huge huge huge fan of Dian Xiao Er. I am a duck person! will surely order the herbal duck if i were to win the voucher! 😀 wish me luck! Our favourite Angelica Herb Roast one whole Duck! Our must order dish whenever we dine at Dian Xiao Er. OMG… hungry now! I would order Ten Wonder Herbs Roast Duck & Jiangnan Baked Fresh Prawn. I will order Angelica Herb Roast Duck. I think my mother would love it as she often finds it difficult to have the duck turn out tender and juicy so this win will save her a few hours in the kitchen. my folks simply love their Angelica Herb Roast Duck and Dong Po Meat. I look forward to relishing Dian Xiao Er's Angelica Herb Roast Duck, Silver Cod Fish in Superior Soy Sauce and Wheatgrass Tofu. Second dish is the Angelica Herb Roast Duck! Angelica Herb Roast Duck had made me love the ducks! they are really professional in this dish. I will order this dish for sure if I win the $50 Giveaway Voucher. 3. Fish Maw with Seafood. 4. top up a bit more to add Dong Po Pork. If I were to win the vouchers, I would order their signature dish Ten wonder Herbs Roast Duck, special Wheatgrass Tofu which I’ve never tried before and also XO Seafood Fried Rice! May we bring in a prosperous new year! 1. Duck Roasted with Ten Wonder Herbs. 2. Old Style Steamed Fish Slices. 4. Claypot Bee Hoon w Chinese Wine. Would love to win this giveaway so that I could share the joy with my family/friends! I will bring my fatherinlaw to eat his favourite: Duck Roasted with Ten Wonder Herbs, Stir Fried Lotus Root with Macadamia nut, Wheatgrass Tofu, Claypot Frog Leg. hope to bring and bring my friends there for a meal! Ten Wonder Herbs Roast Duck & Angelica Herb Roast Duck! I will order Ten Wonder Herbs Roast Duck. Hope to win to enjoy fabulous meal with my family. I love prawns hence will order Jiangnan Baked Fresh Prawn. I will try out Ten Wonder Herbs Roast Duck. Liked and shared on facebook! I would like to try out their signature dish Ten Wonder Herbs Roast Duck. I want Angelica Herb Roast Duck. and Wheatgrass Tofu. I would love to order the Roast Duck and Wheatgrass Tofu! Ten Wonder Herbs Roast Duck and Jiangnan Baked Fresh Prawn! I would order the signature Ten WonderbHerbs Roasted Duck, and try the fragrant JiangNan Baked Fresh Prawns, and healthy Wheatgrass Tofu as recommended! Claypot Sea Cucumber w Shiitake Mushroom and Tendon. Claypot Bee Hoon w Chinese Wine. Congrats to Sophia Basuni, Alan Zai, Susan Koh, Lim Yingyan and Michelle Teo for each winning a $50 voucher from Dian Xiao Er! Please send an email to DanielFoodDiary@gmail.com with your contact details! For the rest who didn’t win, it’s okay – there is still the Dian Xiao Er Grand Reunion Contest to take part in.